Last week, members of the UN Human Rights Council adopted another resolution on Sri Lanka – Resolution 34/1 – renewing the government’s pledges to deliver a meaningful process of justice and reconciliation. In this post, we briefly explain how and why the resolution came about, and what it means for Sri Lanka’s future. Why another resolution on Sri Lanka? Discussion of Sri Lanka at the recent Council session was prompted by the ‘expiry date’ on an earlier resolution – Resolution 30/1 – adopted in October 2015. That text contained a range of commitments by the government of Sri Lanka designed to address the legacy of the war and lay the foundations for a sustainable peace. It included, among others, promises to undertake national consultations with war affected communities, set up an Office of Missing Persons, de-militarize the North, put an end to surveillance – and crucially – establish a special court, with significant international involvement, to address serious rights violations committed during the final stages of the civil war. The October 2015 resolution also provided for the UN High Commissioner for Human Rights, Zeid Ra’ad al-Hussein, to deliver a progress update to the Council, which he duly did on 22 March (following the publication of a written report on 3 March). His appraisal struck a cautionary, and at times scathing, tone. Though noting several positive developments, the High Commissioner placed emphasis on the “rising frustration among victims”, amid both the “slow” rate of progress in establishing the promised institutions for dealing with the past, and the failure by the government to undertake a range of basic confidence-building measures, such as releasing military held lands, reforming the security forces, and resolving long-standing cases of those held under the Prevention of Terrorism Act. On the question of accountability, the High Commissioner stressed that he was “particularly troubled by the lack of progress in a number of emblematic cases”, underlining the ongoing need for a judicial mechanism rendered credible through significant international involvement. Against this backdrop, on 6 March a draft resolution text to succeed Resolution 30/1 was published – alike its predecessor, the product of negotiation between the government of Sri Lanka (acting as co-sponsor) and a ‘core group’ of states (led by the UK, USA, Macedonia and Montenegro). 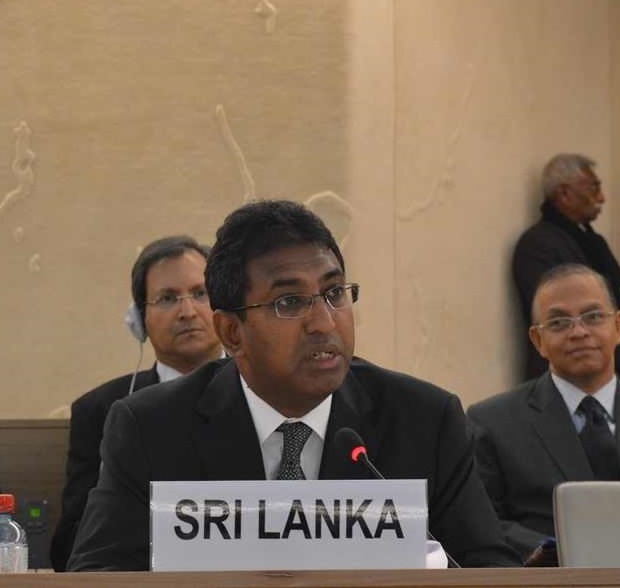 After an intense effort by states and civil society to revise the text in the weeks that followed, and the conclusion of an ‘interactive dialogue’ on Sri Lanka in the Palais de Nations on 22 March (see video below), the proposed resolution was adopted by the Council on 23 March – unanimously and without a vote. The full text is available here. 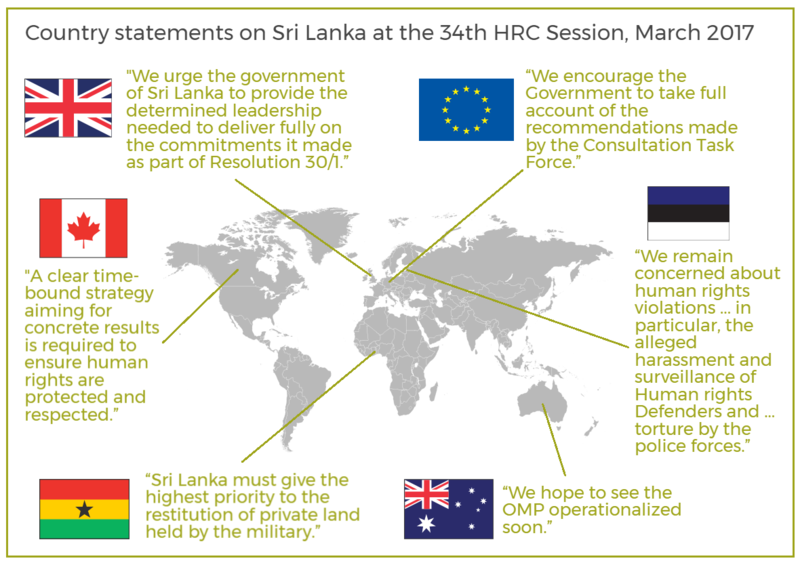 As widely anticipated, Resolution 34/1 re-affirms the government of Sri Lanka’s commitment to implement its outstanding commitments under Resolution 30/1, and keeps these ‘in play’ for a further period of monitoring and reporting by the High Commissioner for Human Rights. Specifically, it requests the High Commissioner for Human Rights to present a written update to the Human Rights Council at its 37th session March 2018, followed by a comprehensive report at its 40th session in March 2019. Besides encouraging further cooperation and engagement between the government of Sri Lanka and UN human rights mechanisms, the text contains no additional substantive commitments, noting simply the “need for further significant progress” on existing ones. The Sri Lanka Campaign will continue to monitor and review the implementation of those commitments here. Is the latest resolution strong enough? To the extent that it keeps the promises contained within Resolution 30/1 alive, as demanded in our recent campaign, Resolution 34/1 represents a minimal victory for progress towards peace and justice in Sri Lanka. Fears of an attempt by the government of Sri Lanka to water down its earlier pledges were not, fortunately, realised, and many will be relieved that, on paper at least, the benchmarks for assessing Sri Lanka’s progress have not shifted. Nonetheless, the resolution could, and should, have been much stronger. Despite numerous recommendations by the Sri Lanka Campaign, and many others, that would have bolstered the text, regrettably few, if any, of these were heeded by the drafters of the resolution. These included a number of relatively uncontroversial yet important demands, such as the acknowledgment of a recent official report based on Consultations with war affected communities, and a commitment by the government to develop a clear public timetable for delivering on its promises. Despite some reassuringly strong statements from a wide cross section of member states at the Council during the interactive dialogue – many of which did echo these recommendations, as well as the findings of the High Commissioner – the failure of key states to push the envelope on the resolution ought to prompt some concern about the overall direction for Sri Lanka in the months and years ahead. As we argued in an earlier post, the international community’s political resolve to push the government of Sri Lanka to ensure it lives up to its promises is now more important than ever. Agreeing a set of commitments is one thing; undertaking the heavy-lifting to ensure they are taken forwards and fulfilled is quite another. That the most senior officials in the Sri Lankan government feel able to immediately contradict their pledges to ending impunity – and worse still, to explain that they feel able to do so as direct result of the space afforded by the international community – is a damning indictment of the prevailing approach to Sri Lanka, one that has seen key states decreasingly willing to speak up for the interests of war survivors in the face of government inaction and backtracking. Statements such as these, and the overall dismal performance by the government of Sri Lanka in fulfilling its pledges over the past 18 months, require members of the international community to urgently re-think their strategy with respect to Sri Lanka. A historic opportunity to address the root causes of cyclical violence is in the process of being missed. If the international community is content to see that happen, then we can look forward to seeing Sri Lanka at the Human Rights Council again in 2 years’ time, with the same unfulfilled promises, with new violations having happened in the meantime, and with trust between communities further damaged – perhaps beyond repair. This is a path Sri Lanka has walked before, and which eventually and inevitably leads back to mass atrocities. If the international community does not, once again, want to find itself complicit in allowing this to happen then it must think much more robustly and creatively about applying pressure to ensure that the Sri Lankan Government honours in full the commitments it has made at the Human Rights Council. Aid, trade and determined political engagement provide some of the levers necessary to effect this change. Promises made on paper, alone, will not.